Now that my youngest is back at college, it feels like fall to me. 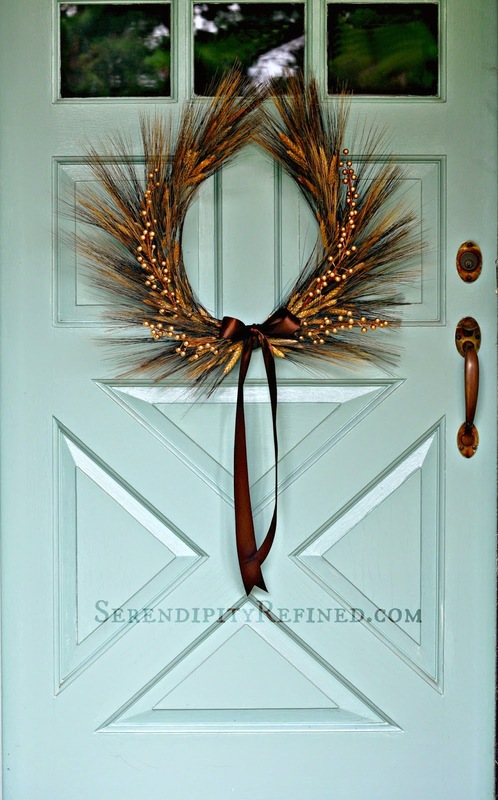 When you take the fact that I'm back to being an empty-nest'er and add to it the chance that I won't have a front door or a front porch to decorate by the time the season actually rolls around, it makes perfect sense that I made a horseshoe shaped wheat wreath and hung it on my door today. Don't get me wrong, I'm not rushing the season. Given the fact that I live in Northern Illinois and at some point within the next couple of months I'll be living in a house that will have no roof and be open to the elements for at least a couple of weeks while they frame the new upstairs, I'm hoping for a nice LONG, WARM, DRY fall that will last until ohhhh...let's say, mid-December. Realistic? Probably not. But a girl can dream. 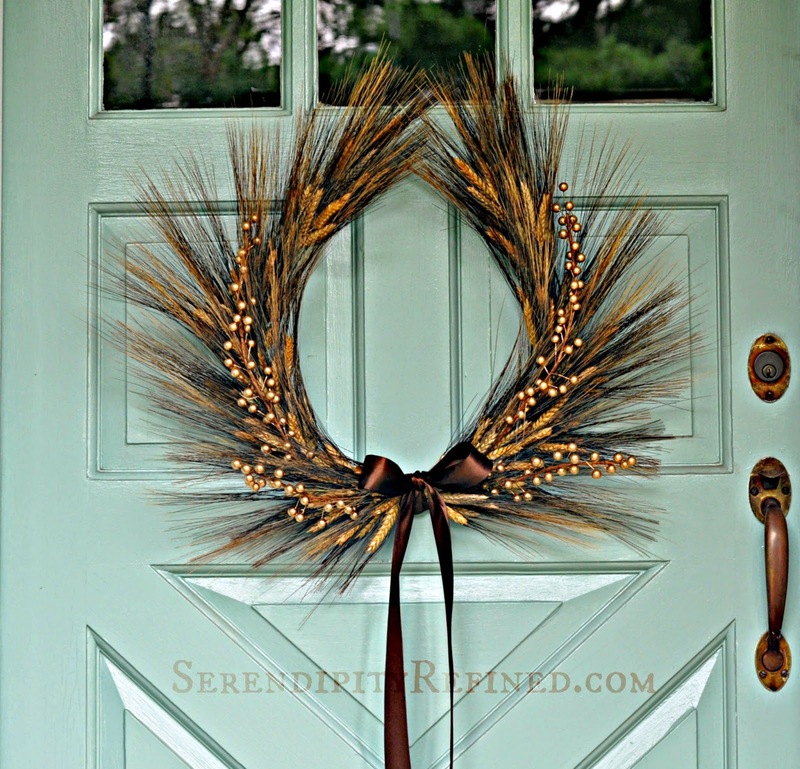 I wanted a fall wreath for my front door that was simple, natural, rustic and would look great against turquoise. 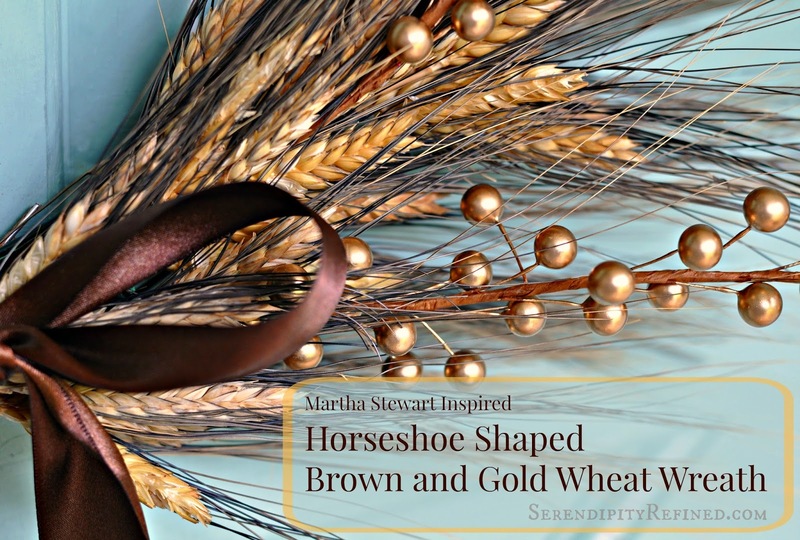 Of course, wheat came to mind. 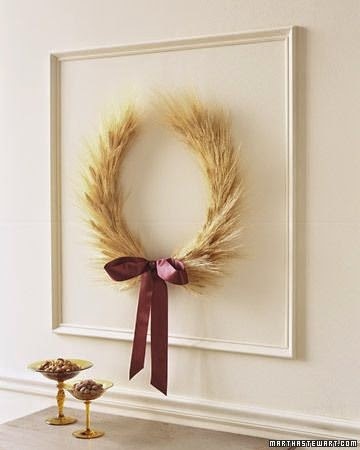 I searched Pinterest and found the wreath above by Martha Stewart Weddings. 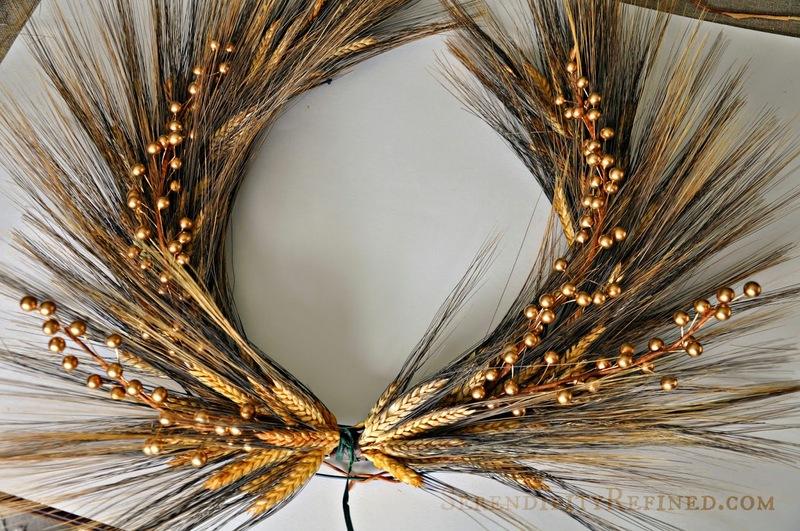 I purchased a 15 inch round wire wreath form, 3 bundles of natural colored wheat and some floral tape at the hobby store. 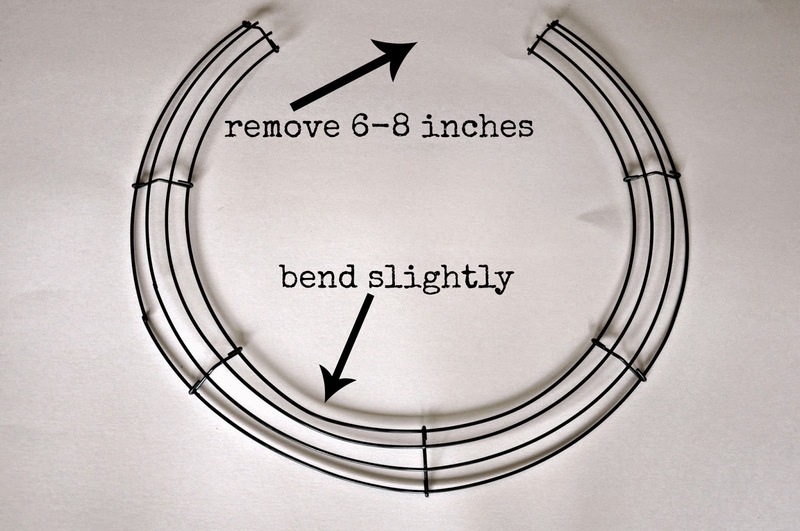 Using my wire cutters (which were, not entirely surprisingly, still in the room from a month ago when I installed the new French country dining room light fixtures), I removed about 6-8 inches (2 "sections") from the form and bent it just a little to make a horseshoe shape. 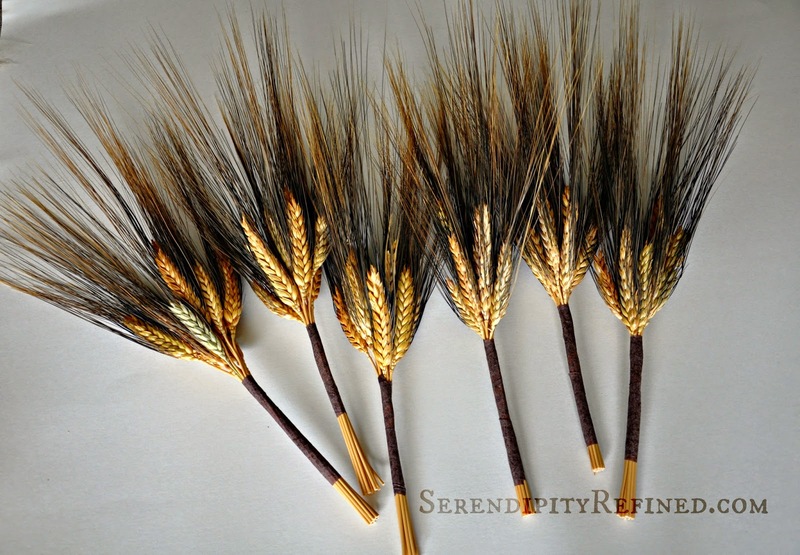 I gathered fourteen bunches containing10-12 pieces of wheat each. I made the heads relatively the same height and taped them with floral tape. 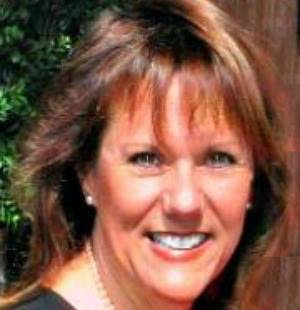 Then, I cut them to a rough length of six inches. Note: I shortened the stems after I wired them onto the wreath. This would work just as well with groups of 6-8 pieces in each bunch and wire. I happen to like working with floral tape and I wanted my wreath a little more substantial. 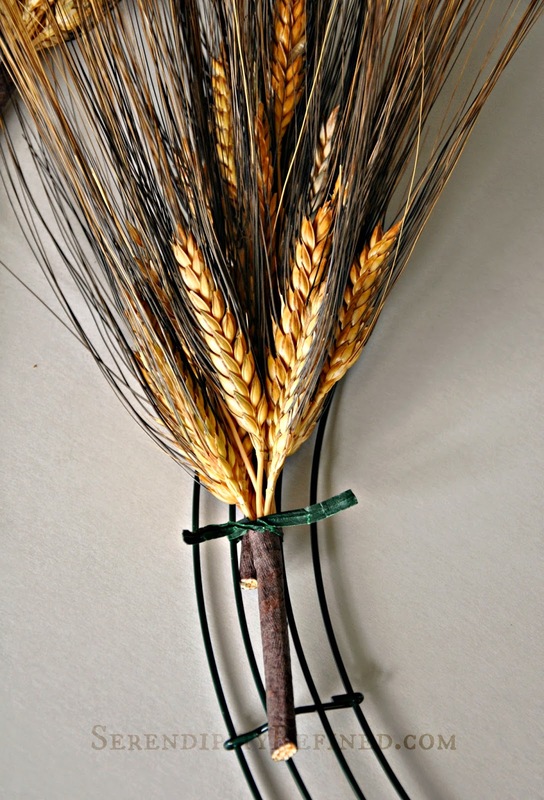 Starting at the top (and just far enough from the end enough so that the wire form can't be seen), I wired the bunches of wheat to the form using small pieces of green wire, overlapping the bunches and cutting the ends as I went. I did this along both sides, working toward the bottom of the form. At the bottom of the form, I cut the stems to about 1 inch and wired them, side by side, as close together as I could get them without crushing the seed pods. 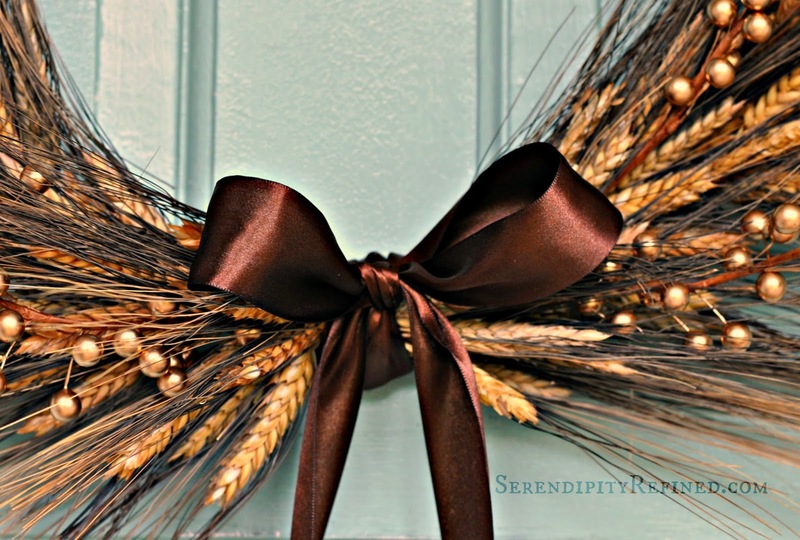 I added a couple of pieces of faux gold berries and then wrapped the section where the wheat met with a four-foot piece of 1 1/2 inch wide, double-faced, chocolate brown, satin ribbon which I tied in a simple bow. Then, I hung it on my front door and stood outside in the rain to take photos. A couple of cars drove past as I was standing there with my camera. They slowed just a little as they went by. I can't decide whether they were noticing that I already have a fall wreath on my door or were wondering what the heck I was doing standing outdoors in the rain with a camera. and get out the pumpkins!